For those that have read this blog before, I apologize for the redundancy, but in my pitch for my website, What’s The Scene, I had alluded to the potential front page for the website (as seen here at around the 4:03 mark)…. The idea behind this is simplicity and functionality. Had my demographic been 18-24, I likely might targeted that audience, but since the audience is a general 18 and up website for various age groups, I kept the design simple. Now, simple in this case is not a “cop out” because many people are leery to use yet another social media website. 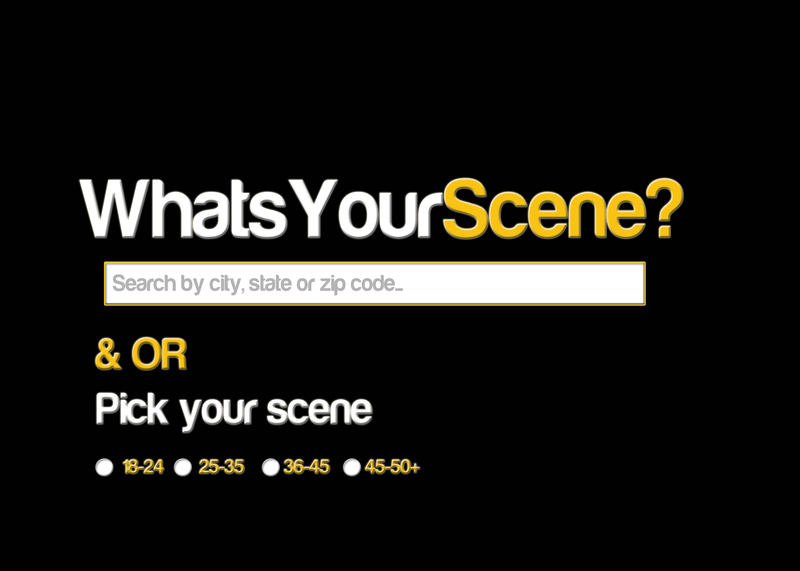 I made a second draft of the logo and really wanted to highlight the word “scene.” The idea is to have the simplicity of a Google, but give the user the opportunity to by the traditional city, state and zip code as well as the option to search by age demographic. The idea is to make the page as unintimidating as possible for any type of user. « What’s The Meaning of This?